Make homemade ice cream. It’s National Ice Cream Day in the United States. You can find recipes in most cookbooks, at the library, or on the Internet. If you want an adventure, try making ice cream the old fashioned way in a tin can. Or, use an ice cream maker, if you have one or can borrow one. Some recipes don’t require any special equipment – they just go directly in your freezer. 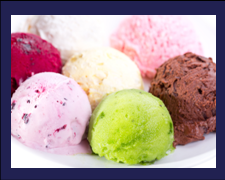 Little known fact: it has been reported that there are over 1000 different ice cream flavors.